Wales forward Hal Robson-Kanu will concentrate on this summer's European Championship finals before finding a new club. 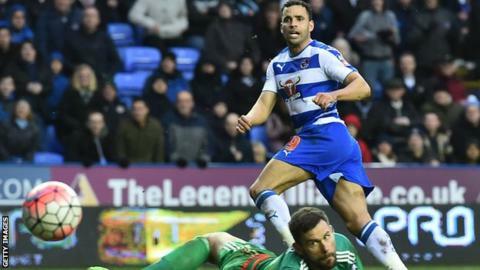 Robson-Kanu will leave Reading when his contract expires in June. The 27-year-old has been linked with a return to the Premier League but says he is focused on Wales. "No one knows what the future holds and I've got a massive summer ahead of me personally so I want to focus on the Euros," he told BBC Radio Wales Sport. Robson-Kanu, who began his career as a schoolboy at Arsenal, has spent seven seasons with Reading. He featured for the Royals in the 2012-13 Premier League season and would welcome a return to the the top flight. "I've had some great times in my career there and am very grateful for what has been a fantastic time," Robson-Kanu said. "Personally I know what qualities I have. "I've played in the Premier League and scored seven goals in one season and know what I'm capable of at international level. "I'll let my agent deal with that side of things. We'll see what happens after that." Robson-Kanu has been included in Wales' 29-man squad that will travel to Portugal for a pre-Euro 2016 training camp. Manager Chris Coleman's final 23-man squad for the tournament will be announced on Tuesday, 31 May. "We're looking forward to getting together and the start of what will be a special summer," Robson-Kanu said. "I'm looking forward to it and can't wait to get going. Hopefully we can achieve something special."